This week I read a very disturbing article titled "New prenatal test is bringing eugenics back to Germany" http://www.lifesitenews.com/news/new-prenatal-test-is-bringing-eugenics-back-to-germany , and I could not help but think of the famous quote from American philosopher George Santayana: "Those who cannot remember the past are condemned to repeat it" This month a new prenatal blood test for Down syndrome created by biotech business LifeCodexx was launched in Germany, Austria, Switzerland and Lichtenstein, and it very possibly may lead to the repeat of mainstream eugenics in German-speaking Europe. The new Prenatal Test is "targeted exclusively toward women in their 12th week of pregnancy and beyond who are at an increased risk" of having a child born with Down syndrome, and the reality of this test is that it places unborn children with Down syndrome at a higher risk of abortion. "In the near future, the PrenaTest will also be able to identify other chromosomal mutations such as trisomy 13 and 18," said Dr. Michael Lutz, CEO of LifeCodexx, and the goal seems to be a society free of perceived culturally mandated "imperfections." Cardinal Christoph Schönborn, Archbishop of Vienna, very strongly criticized the test by stating: "The issue here is artificial selection or eugenics, pure and simple. Is the infernal term 'life unworthy of life' going to become reality again?" The German Down Syndrome Information Centre sums up the issue well and put out this statement: "People with trisomy 21 will, in the long run, be the first people with a different genetic makeup to disappear from our society, and with the tacit approval of the majority." Eugenic history in German-speaking Europe is recent and very well archived, and there are survivors who can recount the dark horrors of this movement. During that sinister period of world history the incalculable value of human life was not acknowledged, and this led to the slaughter of millions. Current statistics indicate that 90%+ of children diagnosed prenatally with Down syndrome are indentified, targeted and terminated. This new prenatal test will only make it easier to select abortion over life, and it may lead to the extinction of all human being deemed defective by a culture of death. 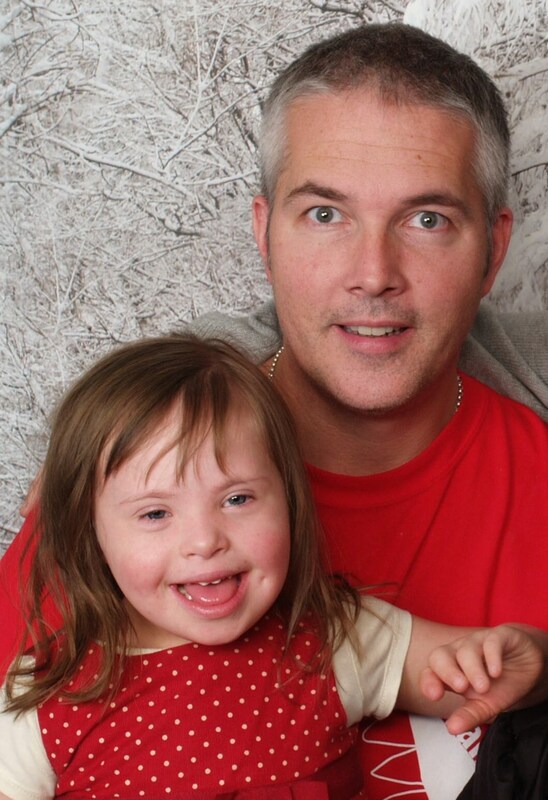 My beautiful daughter Chloe was born with Down syndrome in 2003, and in 9 years she has lived a life more worthy, productive and positive than the majority of people do in an 80 or 90 year life span. I speak whenever asked to any groups I can about what a priceless Blessing children like Chloe are and how they shine a light brighter than anything I have ever witnessed. We had no prenatal tests during my wife's pregnancy, and the only "increased risk" we had after Chloe's birth and Down syndrome diagnosis was the ability to see each day God's true meaning of unconditional love, purity, and unsoiled goodness — I truly don't know what I did to deserve this priceless gift! If the culture of death wants to begin eliminating people based on perceived "imperfections" or "defects" then they should begin with me, and I challenge everyone to look into the mirror and make a list of their defects. Under the secret T-4 program in Germany in the 1930's, individuals with disabilities were labeled "life unworthy of life" and "useless eaters." The Nazi medical community would identify, target, and then terminate the "unfit" members of society, which included those with mental and physical disabilities, and gas chambers and lethal injections were two of the methods employed to rid society of these imperfect members. The first people they came for were the "disabled," and soon thereafter anyone who did not agree and blindly follow this demonic culture of death. Edmund Burke stated that "The only thing necessary for evil to triumph is for good men to do nothing." It is very frightening to me how minuscule and nonexistent the coverage is on this silent eugenic movement, and there is a small group of Voices worldwide sounding the alarm hopefully before it is too late. New Zealand has one of the strongest global Voices, and please share their site with anyone who treasures life http://www.savingdowns.com/ . We need your help in relaying the facts and truth, and we are rapidly passing a point of no return on the slippery slope of a godless world that is on a fast track to repeat the past! Matthew 9:37 "Then He said to his disciples, "The harvest is plentiful but the workers are few."